The Fisker Karma has had a fiery year with a couple car fires, and now in the wake of Hurricane Sandy 16 Karma's in a holding area in Port Newark NJ caught fire and burned. Hurricane Sandy has been wreaking havoc in New Jersey, New York and elsewhere, as the vivid footage and pictures have shown. Jalopnik has unearthed a report that 16 Fisker Karma's were parked in Port Newark, New Jersey in what looks like a holding facility for cars being imported. When the parking area was breached by flood waters due to the hurricane, the Karma's were inundated then caught fire and burned completely. 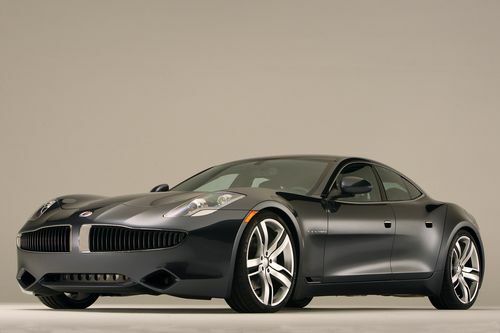 Fisker Automotive has had a bit of a rough year, partly due to problems in battery packs sourced from A123 Systems, and partly due to a couple Karma car fires. The pictures posted on Jalopnik's site show fire damage in both the engine compartment and passenger compartment, with both sections completely destroyed, while the trunk area was not harmed. In the background are shown other vehicles that were also stored in the same parking lot, none of which had caught fire. A couple Karma's also escaped burning. For the most part the concern about fires in the Karma, and before that the Chevy Volt, is whether anything innate to the electric drive train in these cars are especially dangerous. Was the fire due to a failure in something related to the gasoline drive train, or something related to the electric drive train? The answer is what will tell us whether the Karma is more dangerous than "regular" cars, or not. Our society somehow has learned to live with gasoline car risks and the 250,000 or so gasoline car fires that occur every year. It would be impossible to assign a cause based on the pictures. It's tempting to conclude that "submerged" meant the electrical system short circuited, creating a fire in the battery pack. But that might not be the case, if only because the electrical system may be well insulated.